The Short and the Sweet of It: Wednesday Giveaway! Happy mid-week my darling readers. I do hope the week is being nice to you...and if it's not, why not cheer yourself up with a darling little bauble? Kirby and I stumbled upon SoCo Vintage Jewelry and feel insta-in-love. I mean really. How freakin' cute are these designs? You could do a casual lunch with girlfriends and wear the sweet little turquoise one. Fancy up for a business lunch in the white one. Go for a date with the dude in the coral. And hit up a cocktail party with that Chunky Turquoise bib around your neck. I'm sold. Want to win? Of course you do. Just become a follower of our little old blog here and comment below telling us which one you would choose. Please also like SoCo Vintage on Facebook. Good luck my friends! A winner will be announced next Wednesday! I follow you blog, liked them on Facebook, and I am in LOVE with the coral bib! I love the Turquoise Chunky Bubble Bib! It would go with anything. Follow and liked! I'm following and liked on FB. I would love the coral one! Ooooh, how pretty! I follow this blog & I would LOVE the white bib :-) I tweeted as well. turquoise bubble bib! so cute!! LOVE these! I would definitely go with the turquoise or the white! Turquoise bubble bib! Love this giveaway! Fabulous- I would go with Turquoise! I love these! I'd pick the turquoise one. Coral Bubble Bib! It's perfect for fall and would go with everything! Great giveaway! Absolutely love these necklaces!! I would definitely pick the turquoise one!! Thanks for the giveaway! Of course I'm a follower! I would love to own the white bib necklace. I love the turquoise chunky bubble bib!!! I´m really feeling the turquiose necklace, so cute! I love the turquiose necklace! i am a follower! would love the turqouise bubble necklace! Love the turquoise bubble bib! Or the white... Torn! I love the turquoise bubble bib the most!! that could spice up any of my dresses! they are all so cute! don't know which one i'd choose! I liked SoCo Village on Facebook! Love! And love the turquoise one! i'm a follower and i would have to pick the coral bubble bib! so cute and perfect for fall! Who wouldn't love one of these gorgeous necklaces??? That Turquoise Bubble bib is fantastic...Liking them on FB! 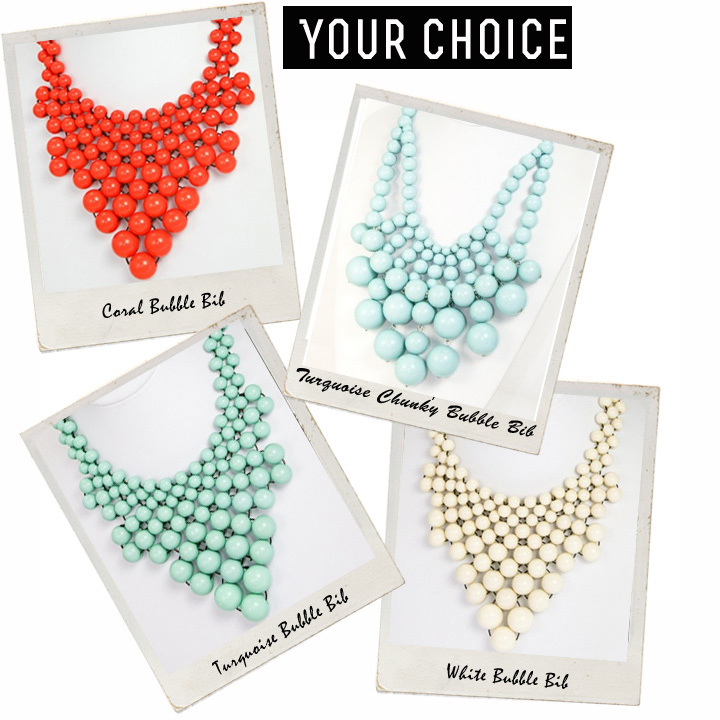 I love the Turquoise Bubble Bib Necklace!!! loving all of them, particularly the white! Love the Turquoise Chunky Bubble Bib! also just tweeted about the giveaway from @moorehe2! Hi friends! This is Tasha, owner of SoCo Vintage. Etsy is having some trouble with their servers and our shop has been down for about the last day. We're gonna make this YOUR gain! If you'd like to purchase any of the items listed on Kirby and Alexa's blog, please visit www.socovintage.com and enter the code SHORTSWEET20OFF at check out for 20% OFF!!!! We're sorry for any trouble the Etsy thing has caused! i think i'd go turquoise chunky. great with a white tee in summer or even black dress in the winter. fab giveaway! I love the Turquoise Chunky Bubble Bib! How did I miss this?! Gorgeous gorgeous!! Who could decide?